I love reading God's word...it's food for my soul. I've come across many Bibles, each with their own set of unique traits and features. I especially enjoy those that include extra book introductions, lists, or graphs, which can actually help me learn more about Biblical history and get a better grasp at what I'm reading. Then there are other times when I prefer a more simplistic approach to reading the Word. Recently, I've experienced a brand new way to read the Bible using The Sola Scriptura Bible Project, which has made me quite smitten. "Smitten" may be a strange way to describe my love for reading the Bible...or maybe it isn't so strange, after all. In essence, this has been a one of a kind Bible reading experience unlike any other that I've had before, and that's why I'm so excited about it. From an outward glance, the collection is quite lovely with each book presenting a tan and navy blue clothed hardcover exterior. All four books arrive in a matching case for easy storing. A blue ribbon bookmark is sewn into each volume for easy place keeping in between reads. The is a very sophisticated looking set of books that has almost a classic literature feel, which I love. Because this is a four book set, the creators were able to stray from using thin, delicate pages and small typeface, which we would normally see in today's Bible. I can easily understand the reasoning behind this design (thin pages and small typeface), since there are a total of sixty-six biblical books being squeezed into one physical book. 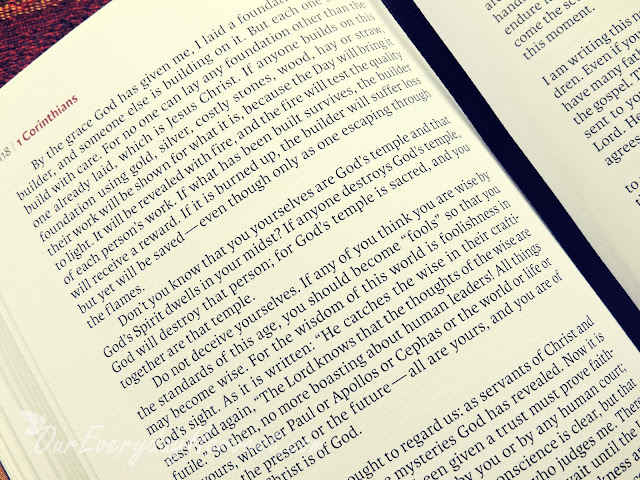 The pages in The Sola Scriptura Bible Project are made of high-quality, thick paper and the font is much larger. The interior page design is a huge bonus for me, especially the typeface which is really easy to read. 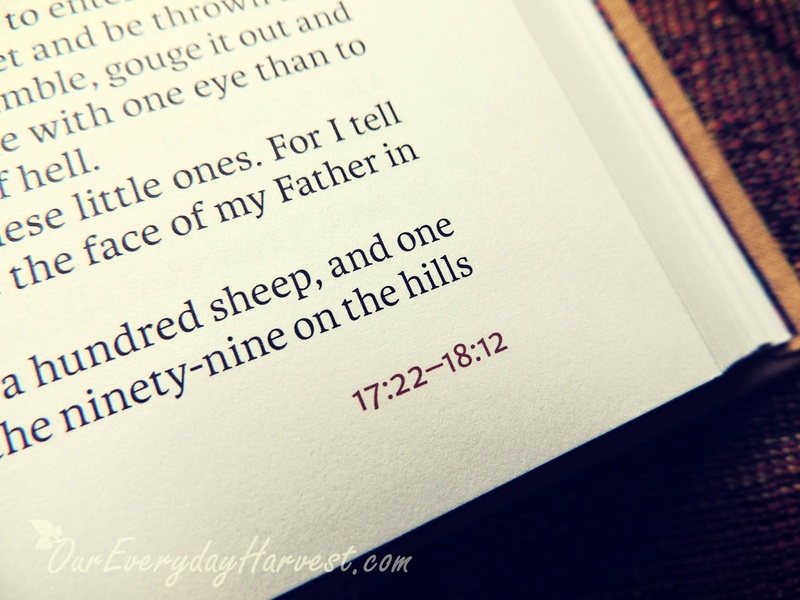 To capture the way the Bible was read during the early church years, The Sola Scriptura Bible Project reads almost like an actual chapter book, unlike the Bibles that we often see today that contain chapters, verse numbers, and cross references. In fact, all of that has been removed in this set, although there is a small notation at the bottom corners of every page to display ranges of chapter references for added convenience. Other than that, this is as simple as they come, yet marvelous, none the less. One of the unique features that does take some getting used to, is the actually book sequencing. While there are some similarities, the order of books are actually a bit different than the Bible layout that I'm used to. The sequence of The Sola Scriptura Bible Project allows each book of the Bible to flow into each other. The books are presented according to what scholarship has determined is their natural internal divisions. The Old Testament is arranged according to traditional Hebrew ordering, and the New Testament is reorganized, placing each of the four Gospels as sectional heads. There is a section in the beginning of each volume that further explains the reasoning behind the uncommon ordering of each book. For instance, The New Testament (Volume 4) begins with Luke followed by Acts, since it makes sense that these two go back to back as a two-part reading segment. The letters from Paul then follow in order to pair them with Luke's writings (since Luke worked with Paul). The Gospel according to Matthew comes next, followed by Hebrews and James. Mark, Peter, and Jude follow, along with the collection of Gospels according to John, and last, but not least Revelation. I absolutely love the approach that the creators decided to take with this. Now don't get me wrong, there's nothing like reading my original Bible with chapter and verse notations. This is just a different way to take it all in. Reading the books in The Sola Scriptura Bible Project almost feels like I'm reading a piece of classic literature, and I guess in some ways you can call it that. At the same time, I'm reading the Word of God in the amazing NIV translation that is easy to follow along to. 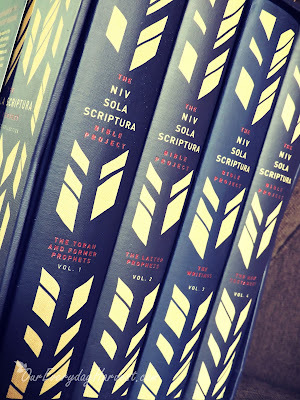 If you're looking for a new way to take in the Word, then I definitely recommend giving the The Sola Scriptura Bible Project a try.